In its day, All in the Family was truly a revolutionary sitcom. Created by Norman Lear, it broke new ground in network television and was the first sitcom to openly discuss subjects like racism, miscarriage, menopause, homosexuality, and breast cancer. 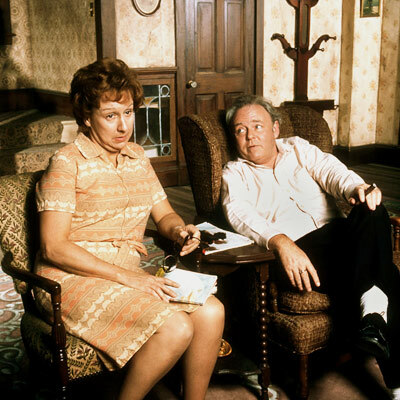 All in the Family revolves around a blue-collar household that’s owned by a bigoted working stiff, Archie Bunker (Carroll O’Connor), and his sweet but dim-witted wife, Edith (Jean Stapleton). Living with them are their adult daughter, Gloria (Sally Struthers), and her liberal husband Michael Stivic (Rob Reiner). Recurring supporting characters are played by Sherman Hemsley, Isabel Sanford, Mike Evans, Mel Stewart, Betty Garrett, Vincent Gardenia, Danielle Brisebois, and Allan Melvin. Struthers once said that the network was bracing for a barrage of angry phone calls but instead received lots of calls from people who wanted to see it return. After eight seasons, Struthers and Reiner left the series. In season nine, Brisebois joined the cast as Edith’s young niece, Stephanie. Her mother had died and her father, Edith’s cousin Floyd, couldn’t take care of her properly so the Bunkers stepped in to raise her. The tone of the series had clearly changed. Who's your favorite All in the Family character? All in the Family ended more than 20 years ago, on March 25, 1979, but the characters continued on in a new series, Archie Bunker’s Place, in the Fall of 1979. The new sitcom focused more on Archie’s neighborhood bar. Stapleton appeared in some of the episodes and then asked to be written out of the show. After that, Edith was mentioned but not shown. In the second season opener, we learn that Edith has passed away from a stroke and Archie and Stephanie are left to continue on together. Edith’s death is foreshadowed a bit in the series finale of All in the Family. In “Too Good Edith,” Archie calls on his wife to help cook the food for the St. Patrick’s Day celebration at his bar. Unknown to him, Edith has a bad case of phlebitis and has been told by her doctor to stay off her feet. She doesn’t want to disappoint her husband but finally it catches up with her and she can’t walk. The doctor chews out Archie and then feels badly that Edith hadn’t told him. In the final few moments of the series, Archie visits Edith in bed. Though the characters would continue on, the last scene makes a sweet end to the series and shows the heart of a bigot like Archie Bunker. Take a look. Yep. But I believe it’s Sony’s intent to make you purchase the DVDs just to see the final episode. If Sony owns it, I doubt that you’re going to see it on YouTube without some kind of price. And then they get upset when people use bit torrent downloads. Why do I remember seeing the actual episode where Archie finds Edith in bed, after she has passed away? And then I remember Gloria coming for the funeral. It’s a bit vague in my memory but I do remember seeing it. Where is that episode? It might have been on Archie Bunker’s Place but I’m not sure. Sorry, but it doesn’t exist. We learn that Edith had died between the end of season one and the start of season two of Archie Bunker’s Place in November 1980. Archie remembers trying to wake her up but we don’t see it. Gloria and Joey didn’t return to visit Archie until February 1982 — on their way to start the Gloria spin-off. Perhaps you’re remembering part of another episode or visualized it based on what Archie says. Stapleton wasn’t in the Archie Bunker’s Place episode where Edith died. Perhaps you are wrong. I remember him finding Edith dead also. SORRY Trevor, You’re mistaken. Archie leaned over and discovered Edith had gone on. Perhaps the episode has been lost. I distinctly remembered this episode also and have been searching high and low for it. It did exist and am posed that I can’t find it. I really n truly feel that ALL IN THE FAMILY was indeed one of the very best shows on television…althou 4 some reason, I only loved seasons 6 thru 9. I WATCHED ALL IN THE FAMILY WHEN IT CAME OUT AND WAS TURNED OFF BY YELLING THAN WHEN I UNDERSTOOD IT AND GOT THE HANG OF IT, SHE SHOW GREW ON ME. THE CHARACTERS WERE SO INTENSE AND BIG ENOUGH TO FILL THE WHOLE SCREAN WHICH THEY DID AT TIMES. UNDERNEATH ARCHIE WAS AFRAIDE TO SHOW HIS TRUE FEELINGS. EDITH WAS DEDICATED AND SHARP IN HER OWN WAY. MICHAEL AND GLORIA WERE FUNNY TOO. MANY OF FUNNY MOMONETS IN THIS SHOW AND NOW I SEE RERUNS ON ANTENNA TV AND I LAUGH EVEN HARDER. …funny you mention being turned off by yelling. taught to be the “bread winner” and was considered his last words meant he was the boss. I now watch the reruns with a different perspective and thank God I don’t have someone that is that insecure in my life. We have just purchased seasons 5 and 6 on dvd – my son LOVES the show – he keeps on asking – “they were allowed to say that at that time?” – If the show still makes a teenager laugh over 20 years later, then it was one heck of a show.. I watch the first six seasons over and over on DVD, I never get tired of this wonderful show. I wish they would release the remaining seasons. Strangely enough, the first season of ‘Archie Bunker’s Place’ is on dvd, when the entire ‘All In The Family’ series has yet to make it to store shelves. Unfortunately it is all about the margin. As sales slump, they will not continue producing. The first season of Archie Bunkers Place was discontinued due to poor sales. No other seasons would follow on DVD. A 2015 decision is to re-release season 1 on DVD (according to Wikipedia) so hopefully the rest of the series will follow. Season 2, episode 2, “Archie Alone” part 2, is owned by BBCA Sony and isn’t available in USA, for whatever reason. Hopefully it will be released on DVD.